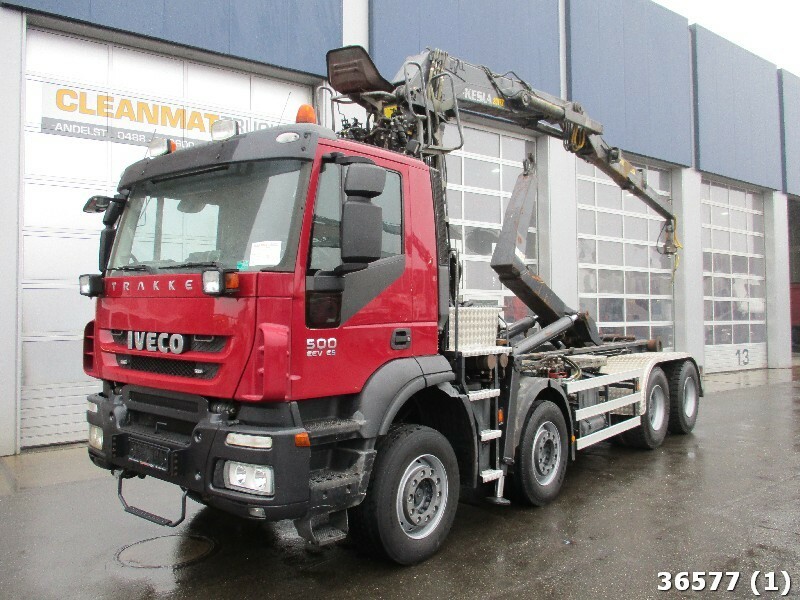 Our IVECO Trakker hook lift truck are available in a dealer's stock under your request. Engine details/gearing and fuel type: Euro 5, diesel, displacement: 12882 cc, 500 hp, differential lock, gearbox: manual, transmission: Schaltgetriebe, power take-off. Wheel formula and suspension type: suspension: spring/air, front axle suspension, 8x4, number of axles: 4, steering axles, wheel base: 5000 mm, ABS, front tires: Achse 1: 385/55R22.5, 50% / Achse 2: 385/55R22.5, 30%, rear tires: Achse 1: 315/80R22.5, 50% / Achse 2: 315/80R22.5, 40%, dual wheels, trailer coupling. Transport dimensions: length – 9200, width – 2500, height – 4000. The mileage is 297754 km.